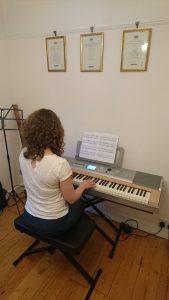 I specialise in Flute, Theory of Music and beginner Piano tuition providing a relaxed, friendly and low pressure learning environment at my house near Long Ashton, Bristol. Whether you are just starting out or already on your musical journey, I will tailor lessons to suit your needs and help you achieve your goals. Whatever your age, it’s never too late to learn and enjoy the benefits that playing music can bring to your life. If 10 or more lessons are booked and paid for in advance, a 10% discount will be applied.